The rate of dividend growth has been slowing down in recent years, due to lack of earnings growth. The company reached a peak level of earnings in the $5.17 - $5.26 level in 2012- 2013. It earned $4.48/share in 2016, and is expected to earn $4.83/share in 2017. As a result of this lack of earnings growth, we have the dividend payout ratio increasing to 88.60%, which is very high. If earnings do not start growing soon, we may witness a halt to annual dividend increases. I believe that the dividend is relatively safe, because a high payout ratio is normal for tobacco companies. Furthermore, earnings have been somewhat depressed in the near term due to the strength of the US dollar. Now that the US dollar is starting to weaken, the results of companies like PMI that sell abroad should benefit. At this point I view the stock as overpriced above $96/share. This article provides a rough guideline of how I determined this amount. Realty Income Corporation (O) is a publicly traded real estate investment trust. It invests in the real estate markets of the United States. The firm makes investments in commercial real estate. The REIT raised its monthly dividends to 21.20 cents/share. This dividend achiever has rewarded shareholders with a dividend increase for 23 years in a row. Dividends per share have risen from $1.56 in 2007 to an estimated $2.54 in 2017. This was supported by FFO growth from $1.89 in 2007 to $2.88/share in 2016. The REIT yields a sustainable 4.30%. I would be interested in adding to this REIT at yields around 5%, which is equivalent to an entry price below $51/share. 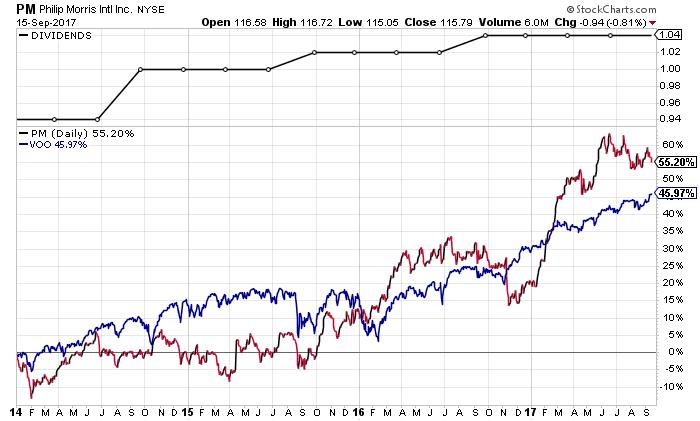 I reviewed the company as well as two other REITs in an article a few months ago. It discusses the performance of the business in a little bit more detail. Please check this article on the Five Things to Look For in a Real Estate Investment Trust, if you would like to see the factors I look for in evaluating REITs. Verizon Communications Inc. (VZ), through its subsidiaries, provides communications, information, and entertainment products and services to consumers, businesses, and governmental agencies worldwide. The company raised its quarterly dividends by 2.20% to 59 cents/share. 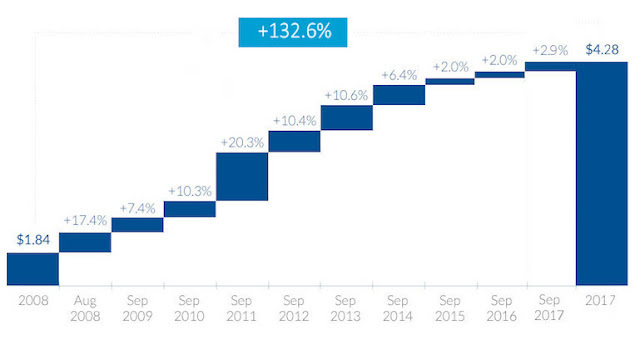 This marketd the 13th consecutive annual dividend increase for this dividend achiever. 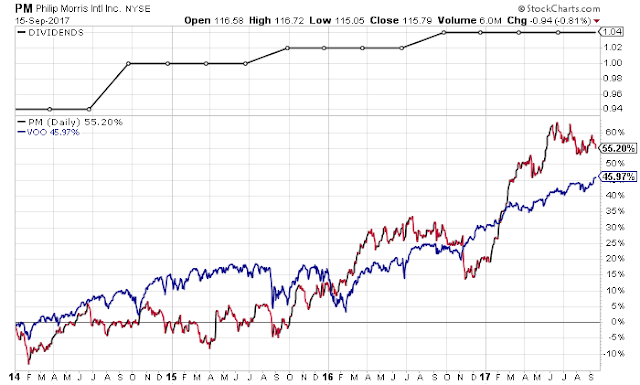 Over the past decade, Verizon has managed to boost its annual dividend at a rate of 3.40%/year. The company managed to grow earnings per share from $1.90/share in 2007 to $3.21/share in 2016. Verizon is expected to earn $3.76/share in 2017. I view the stock as fairly valued today at 12.70 times forward earnings, yields 5.10% and has a dividend payout ratio of 62.80%. The dividend is well covered. Verizon is a decent pick for those retirees who are looking for high current income. However, the high dividend is not going to grow above the rate of inflation over time. Therefore, it may not be as suitable for younger investors today. In this article, I discussed AT&T and Verizon in more detail. What is your opinion on those companies? I would love to hear from you at dividendgrowthinvestor at gmail dot com.